At summer camp we were treated to a fantastic breakfast treat each session: waffles with a scoop of ice cream. Thanks to our friend Wes Jones at Honeysuckle Gelato, we were able to recreate the magic for grownups. Honeysuckle Gelato has a fabulous new flavor called The Kang. A tribute to The King, Elvis Presley, this yummy flavor is a toasted banana base with ribbons of peanut butter caramel. They would have added bacon to their ice cream but the Feds would have to shut ’em down! We added the bacon into PrettySouthern’s recipe. This dish does take a while to prepare, so in true Southern fashion, we used ingredients we had to create a starter! Preheat oven to 350. Mix Brown Sugar, Nutmeg, Cinnamon, and Ground Mustard in a shallow tray or bowl. Lay Bacon in dry rub then twist in the mix to form a Bacon Twist. Place Bacon Twists on a baking rack (with a foil lined tray underneath to catch the drippings). Bake for 25 minutes, remove and let cool for at least 5 minutes before serving atop a scoop of The Kang. 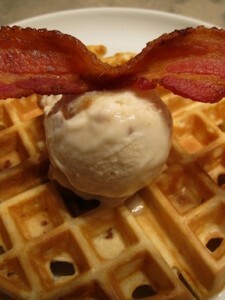 This treat was a great way to prep our palettes for the delicious Bacon Waffle concoction. Either eat the Bacon Twist in between bites of The Kang or break it up and mix it into your ice cream…it’s all going to the same place. While munching on your sweet appetizer, start working on your main course. Buy 1 quart of The Kang from Honeysuckle Gelato (purchase remaining ingredients from grocery store). Cook Bacon to a crisp, but not blackened. Place on paper towel and set aside. Select a few whole strips to use as garnish. Once cooled, chop the rest of your bacon into pieces (y’all want to have chunks of the bacon visible in the waffle). We used our Slap Chop to get perfect sizes of bacon. Separate your Eggs, Whites in one bowl and Yolks in another. Combine Yolks with Milk, Vanilla and Butter. Mix Flour, Sugar, Baking Powder and Salt together then mix with your wet ingredients. Beat the Egg Whites until frothy then mix with your batter. Add in Bacon. Start your Waffle Maker, spraying the iron down with a good helping of Non-Stick Cooking Spray. Bake your Bacon Waffles, then top with a scoop of The Kang and a slice of Bacon. Drizzle with Good Maple Syrup. 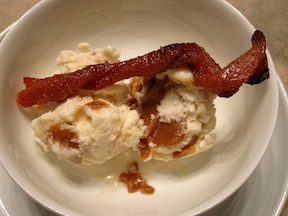 What’s so great about this dish is how well they salty & sweet flavors compliment each other: the savory bacon works with the peanuts in the ice cream and the rich sweetness of the banana-caramel-syrup combo is truly a delight. For more information on Honeysuckle Gelato, check out their website or their Facebook page. Lauren, you’re killin me!!! That Honeysuckle Gelato looks OUTSTANDING! And then I made the mistake of looking at all their delicious flavors that I cannot enjoy, because they’re only in GA 🙁 Sea-salted Caramel, The Kang and Honey Fig are at the top of my list! Am I going to have to return to GA for the first time in years just to try this gelato?? Is it THAT good?? PS: I can’t wait to try your candied bacon recipe out — yum!